In eastern China, Fuchun Technology said "nearly sixty" out of its 200 employees have taken advantage of 100 to 500 yuan ($15 to $29) Huawei phone subsidies as of Saturday. "We are supportive of good China-made brands," a spokeswoman told AFP, adding that the subsidies are part of employee benefits and were not "guided by the government." One company has even threatened to fine employees who buy iPhones, charging them 100 percent of the smartphone's market price. The surge of patriotism began after Meng Wanzhou, Huawei's chief financial officer, was detained in Canada on December 1 on a US extradition request linked to sanctions-breaking business dealings with Iran. But some in China see Meng's arrest as part of a broader conspiracy to suppress China's high-tech enterprises, with nationalist tabloid Global Times accusing Washington of "resorting to a despicable rogue's approach" because it cannot stop Huawei's progress in the 5G market. The internal notices announcing the Huawei subsidies started circulating on China's Twitter-like Weibo earlier this month, and have split Chinese internet opinion. 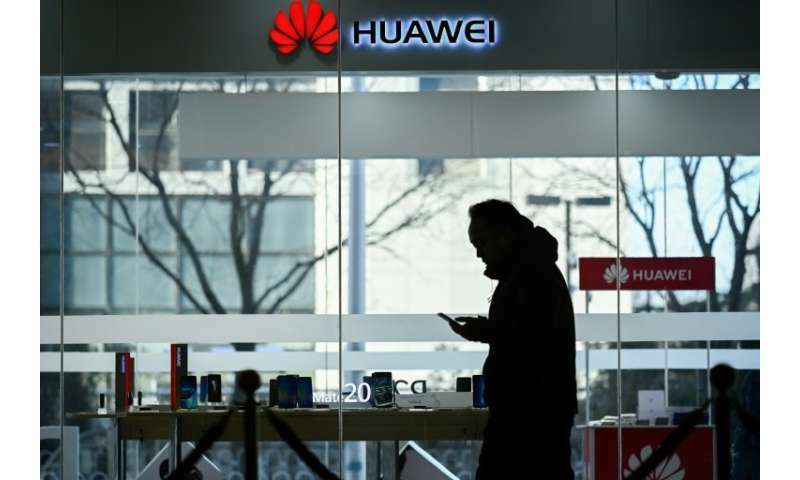 Some users were in favour of buying phones in the name of patriotism, while others questioned whether or not Chinese firms were simply leveraging Huawei's case as a marketing strategy or branding opportunity. "Those companies are conscientious for standing by Huawei's side," praised one Weibo user, using a thumb's up emoji. "The government should also publish an official document to support domestic brands." But another user, who said they supported Huawei, criticised the practise of punishing staff who purchase Apple products. To win respect, domestic tech brands should "keep fighting despite setbacks and adopt an attitude of not accepting defeat," they said. For the bigots screeching their terror of the "Yellow Peril"? This news goes to show that the average Chinese are just as treestump stupid as the average trumpanella voter! Got your "Made in China" official MAGA beanie yet? With thec little propeller on top? VP Pencil is promising it will carry you to heaven during the rapture! After your check clears for your order. I guess with using labels and disparaging our leaders you are even stupider! BTW have you refused your tax breaks. and refused any of the many jobs that have been created? My guess is you are so full of unjustified self righteous hate you are blind. For sure you are a puppet of the media and the big oil companies. Neat, PLAN Department 349 kickbacks. We still wanna see the source code. Might as well, the NSA already decompiled it. I mean, after the chip hacks found in Huawei phones and routers, I'm sure everybody's gonna flock to be monitored by the Chinese. You cannot possibly be serious. If you are you're stupider than a box of bricks. Gosh DS, those agents implanting secret control chips & backdoor hacks in program codes, since the 1950's, looked awfully U.S. acronym agency white to me. Didn't see a chinaman in the bunch. We did it to ourselves & we taught it to everybody else. Are you complaining that the chinese are smarter crooks than us yankees? Oh & rderkis. Those ain't my leaders. Those are pimp putin's chosen puppet whores. You lickspittle toadies for fascism can grovel all you want to your master fuhrer putin & the saudis. You are just quislings & copperheads, all dressed up in your mpmma's satin klan robe. Though perhaps you should of shaved before applying the rouge & lipstick. Wow rwillsj, your head and thinking is more messed up than I had imagined! You are so full of hate and conspiracies it will be hard to fix even when they can get your brain chemistry in balance. Perhaps you should just commit yourself for society's sake. Let's sum your comments up. I have seen racist remarks from you, Sexist remarks from you. And just a LOT of hate. Now if your starving, without shelter or water I can understand but I am guessing you live in the United States where we are better off than 93% of the rest of the world and your still crying, it's not enough. well, at least I did not display my hate by voting for the whores trumpenella & pennyante in a deliberate copperhead sedition to destroy the IS Constitution & bring down the Union. Sure, your happy. You get to dress up in a snazzy uniform & shiny jackboots. Playing the SS/Cheka thug to amuse your pimp putin. The rest of us find you sheep ticks to be repulsive. It doesn't matter who invented it. The question is if we want it in 5G under the control of a single government. Which is historically racist and opposed to Western governments and wishes to undermine them. You find everyone and everything to be repulsive, that's part of your repertoire of hate. If you didn't find me the same, I would worry for my soul. @rderkis is in favor of the ability to interfere with cell phone communications in the hands of the Peoples' Liberation Army of China. Who are you, anyway? Who do you work for? rderkis, I suggest you find a cobbler & get your worn-out holey sole replaced! rrwillsj, with your hate and choice of words you sound more like Hitler than anyone I EVER heard before. Same hate and passion for that hate. Directed at anyone you disagree with in the slightest. You hurl names and insults at them while twisting their words. An example is our GREAT president Trump. Now you will start hurling insults and rage. Your words will be that of a insane man, much worse that President Trump's words have ever been. DS, what does matter in the long-running scandals of governs manipulating computer hardware, systems & programs. Direct cause of hacking & cracking with multitudes of systematic failures & physical malfunctions. Oops! Uhhm, just ignore that." "That's an order!" You should appreciate the monumentally diabolic screwups when all the competing Chinese government acronyms start interfering with each others covert operations. Whereupon crashing headlong into mosh pit of tinsel-carnality that all the other nations have produced. You might also consider the strategic advantages of having the manipulated programs & compromised circuitry. While those are in useless toys. Available to reverse engineer. That's where the Chinese got the idea from. We sold it to them! Rather than waiting to hear a scream of "Incoming!" When the nearest slit trench is too far away? No, we are complaining that you Chinese crooks are much stupider than the US crooks. For one thing, rrwillsj, your Chinglish is a dead giveaway. No one in the US talks like you! @rrwillsj, I have been a computer scientist for most of the big hacks of the last 30 years or so. I have no idea what you're talking about with all this stuff about the US government manipulating things. They never got anything I was in charge of. Perhaps you have some data to support your view.